Matthew 24:6:And ye shall hear of wars and rumours of wars: see that ye be not troubled: for all these things must come to pass, but the end is not yet. The start date of this exercise is 15 July 2015. 11 days after July 04. The Ninth of AV in 2015 (Hebrew year 5775) is 26 July 2015. 11 days after the beginning of the exercise. The number 11 features prominently with occultists. Jade Helm is the USA military's "training exercise". It is a practice attack against the American People for the ineluctable implementation of martial law. Operation Jade Helm 15 Logo Below on the left Is Satanic Illuminati Freemason Symbolism. 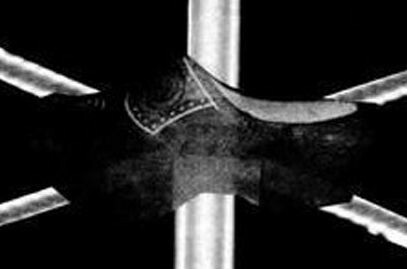 It contains the two arrows and a sword that looks like a blade. Possibly the "V-42 Stiletto," which is the knife that the Army's Special Service Force used in WW2. Why does the logo feature weapons from medieval times? A sword or a knife. 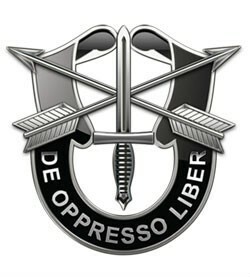 The arrow and the knife appear to be a derivative of the US Army's Special Forces Logo as shown in the image on the right hand side above. Look closely at the center of the Jade Helm logo (the top left hand side image), in the 1st photo above, a transparent shoe (wooden clog) appears in the center of the logo. 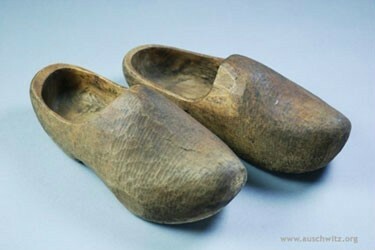 The shoe (wooden clog) is ghostly in appearance. The wooden clog, is hidden in Plain Sight, in the Middle of the Jade Helm Logo. There is a pattern on the top of the shoe, and there are three small lines in front of the pattern. The word "sabot" means wooden shoe. The word "sabotage" originates from the word "sabot". Notice the similarity to the inverted contrast, negative image above, including the 3 small lines. Wooden clogs were a part of the clothing that prisoners wore during the holocaust. During the occupied days of World War ll, people who were in the resistance, threw their sabots, (their shoes) into machinery, the machinery would break, hence "sabotage" came from that activity. Does the Jade Helm logo illustrate what "they" intend to do in their operations? What is the significance of the word "Sabot" or sabotage? Anyone who warns others or opposes them could sabotage their plans. It begs the question, is the wooden shoe (clog) a symbol being used as an illustration of what "they" will do to the humans to prevent their plans from being sabotaged as they "master the human domain"? 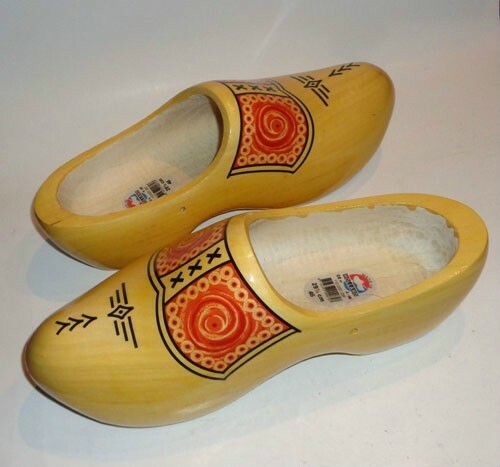 Is the wooden shoe (clog) symbolic of the round up of the people who speak out, warn others and oppose the plans of the New World Order? Will Jade Helm lead to live extractions and detention of individuals who oppose their plans? 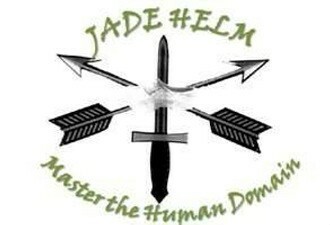 What is "The Human Domain" that appears at the bottom of the Jade Helm logo? It is the focus and strategy that the US Military is going to incorporate into future operations and theaters of war. The concept of Human Domain is a part of "phase zero shaping." What is "phase zero shaping"? Phase 1 - the run-up to hostilities - Deter. The intent of this phase is to deter undesirable adversary action by demonstrating the capabilities and resolve of the joint force. It includes activities to prepare forces and set conditions for deployment and employment of forces in the event that deterrence is not successful. Phase 3 - major combat - Dominate. The dominate phase focuses on breaking the enemy’s will for organized resistance or, in non combat situations, control of the operational environment. Phase 4 - "post-conflict" stabilization - Stabilize. The stabilize phase is required when there is no fully functional, legitimate civil governing authority present. The joint force may be required to perform limited local governance, integrating the efforts of other supporting/ contributing multinational, IGO, NGO, or USG department and agency participants until legitimate local entities are functioning. predominantly characterized by joint force support to legitimate civil governance in theater. The goal is for the joint force to enable the viability of the civil authority and its provision of essential services to the largest number of people in the region. In the new millennium, budgets have been reduced. There has also been a change in traditional enemies to include "non-state actors" i.e. - terrorists and insurgents. As a result, the US Military has had to adapt to a new war strategy to include dealing with smaller groups. In the past, the focus of an operation was to conquer real estate and terrain. In the future, the focus will include the variable of "humans" who make up the terrain of a region. This means that a new method had to be devised to deal with the "humans" that populate the area of future war. In the new method, the US Military has coined a phrase that describes the people as "human terrain." The US Army decided that it is better to know the "exact identity" of the humans that they will encounter in their operation; because then they can be better targeted, engaged, detained or eliminated. For the strategy to be successful, the military will need to obtain "data" and "intelligence" on the human targets and deal with them in advance of the phase of "boots on the ground, or phase one." The success of this task, will result in the military having dominion over the "human terrain" or in other words, they will be able to "MASTER THE HUMAN DOMAIN!" This is what the Jade Helm logo says! Revelation 12:13 tells us that the Antichrist will hunt down every person. He will deceive people into taking the Mark of the Beast without which they will not be able to buy or sell to meet their needs (Revelation 9:1-12, Revelation 13:16-18). He will also go to war with the nations that resist his rule. More than one third of the world population will be killed in the war with Asia that results (Daniel 8:24, Daniel 11:44; Revelation 9:13-21). He (THE Antichrist) will have total control that will bring a form of deceptive “peace and prosperity”. Jesus and Paul predicted this deceptive "peace and safety" would be in place right before great destruction from God comes and brings the end of the reign of the Antichrist (Matthew 24:38-39; 1Thessolonians 5:3). The name Jade Helm is both cryptic and revealed. Jade comes from China. Helm means to be in control. Is this the complete meaning to the phrase? If we use China as the key, the great war strategist, Sun Tzu had many writings about war, including the classic, "The Art of War." Chinese literature also has other strategic books about war including, "The 36 Stratagems of War". This work has been attributed to Sun Tzu by several Chinese scholars. It is a collection of thirty-six stratagems that are useful in war. Bait someone by making him believe he gains something or just make him react to it ("toss out a brick") and obtain something valuable from him in return ("get a jade gem"). Could this be what the Blackhawks will be doing in the Jade Helm exercises? Are they going to purposely stir people up so that they can determine which citizens will object and which ones will try to do something about it? If so, this exercise is going to gather "data" from the "human terrain" of America. In order for the military to be successful with this strategy, they must first obtain the DATA or INTEL of their targets. Before an operation begins, the Military sends in people to blend in and gather data. They are called Human Terrain Experts; social scientists who have majored in Anthropology, who are very good at mapping people. The Human Terrain teams arrive approximately six months to two years in advance of the first phase of military operations. They arrive early so that they can infiltrate the local community to acquire the data on the people. The phase of gathering data has been added to the list of operational phases. But since it must occur first, it is called "phase zero." Section 1074—Pilot Program for the Human Terrain System. This section would require the Secretary of the Army to conduct. a pilot program to utilize Human Terrain System assets in the U.S. Pacific Command area of responsibility to support Phase 0 shaping operations and to support the theater security cooperation plans of the geographic combatant commander. These two phrases are the foundation of Jade Helm and the future scheme that will be used to round up US citizens. As shown in the latest National Defense Authorization Bill, funding was allotted for a pilot program of the Human Terrain System or HTS. Relatives of any of the above. Sympathizers of any of the above. And more ..the list is too long. This is not the first time that this strategy has been used by the US Military. During the Vietnam War, the CIA utilized teams to infiltrate Vietnamese Villages and gather intelligence about the local population. The data was then used to assassinate, imprison and torture Vietnamese civilians. The program was called CORDS which stands for Civil Operations and Revolutionary Development Support. One of the activities of CORDS was an operation called the Phoenix Program. In Vietnamese, it was called Phụng Hoàng. The Program was designed to identify and "neutralize" (via infiltration, capture, terrorism, torture, and assassination) the infrastructure of the National Liberation Front of South Vietnam (NLF or Viet Cong). The CIA described it as "a set of programs that sought to attack and destroy the political infrastructure of the Viet Cong". Many of these people were taken to interrogation centers where many were tortured in an attempt to gain intelligence on VC activities in the area. The information extracted at the centers was then given to military commanders, who would use it to task the PRU with further capture and assassination missions. The program was in operation between 1965 and 1972, and similar efforts existed both before and after that period. By 1972, Phoenix operatives had successfully neutralized 81,740 suspected NLF operatives, informants and supporters, of whom between 26,000 and 41,000 were killed. While the "official" report may claim success, the program came under scrutiny because the assassins were allegedly instructed to kill 400 civilians per month! United States soldiers are brainwashed and programmed to believe that these types of behaviors are acceptable. Soldiers follow orders regardless of the morality of those orders. The US government is good at brainwashing recruits and turning them into soldiers who follow orders to torture and do things that are against their conscience! Veterans and military are reaping and shall reap what they have sown; for the things they have done to others around the world, as well as for what is yet to come. Your children did not die defending the US from "Muslim Terrorists." They died defending the New World Order plan and serving Satan's purposes. They died serving the Babylonian fractional reserve racket of usury which relies on the sleight of hand (alchemy) of an 'economic cycle' designed to enslave and defraud the world. Instead of harming others, they should be protecting them from the the New World Order. Anyone who served in the military was used as a pawn in the New World order agenda. Pay attention to these verses below police officers and military, because they apply to you - repent and choose Life. You were hired to protect us. If you fail to do your sworn duty, then God will hold you accountable for the blood that has been shed and that blood that is shed as a result of you failing to warn and protect us. Turn from evil and repent - choose Life. The police and the military bear a greater responsibility than most people. Every person in the police and the military volunteered for that job. Too many are failing the American People. Revelation 16:9: And men were scorched with great heat, and blasphemed the name of God, which hath power over these plagues: and they repented not to give him glory. Revelation 16:11: And blasphemed the God of heaven because of their pains and their sores, and repented not of their deeds. Do you know Jesus Christ as your personal Lord and Saviour? The time is now to repent. Today is the day of Salvation - choose Life. The training for "Human Terrain Experts" is located at a facility in Leavenworth, Kansas. The final exam for the trainees requires that they infiltrate the city of Leavenworth and try to gather data on the citizens without their knowledge. The trainees are also given an imaginary scenario to follow which says that portions of the United States have seceded. The problem area is in the Heartland from the Dakotas to Missouri. The job of the "terrain" experts is to infiltrate the protest zone and infiltrate the "criminal" groups. They are then supposed to "map" the group participants so that the military can put a stop to them. This training scenario is disturbing on so many levels. ARSOF 2022 - Army Special Operations 2022 - a blueprint for change. ARSOF 2022 part 2 - Human Domain and the Conduct of Campaigns. US Army - Internment Resettlement - How the military will intern citizens. "Jade Helm" is a manifestation of transformation and change for the US Military. Note: Pearl Harbor was a false flag created by the communist FDR. So, what they are saying in their document is that another false flag is imminent so their evil plans can move forward. As you read the document above titled "Rebuilding America's Defenses", pay attention to the themes - namely "transformation and new technologies". The Bible tells us in the Book of Revelation - Chapter 13 that in the time of the end, a Beast would rise from the sea having great power and authority. This Beast would be an evil empire that rules the world with tyranny and satanic power. The Vatican (1st beast) will use its governing authority to rule with military strength - USA 2nd beast - military power. This will enable it to control the world's population by force. The CIA created ISIS/ISIL/IS: ISIS = "IS US" or "IS USA"
The USA govt continues to create it's One World Military while pretending to "fight" ISIS. Jade Helm is an attack by the USA govt against the American People. The psychological warfare against the American People is constant and never ending. Psychological warfare ALWAYS precedes the real attack. May 6, 2015 Why Is The US Military Training Only 90 Syrian Rebels? The end time regime will use tyranny, fear, duress, detainment, rendition, torture and surveillance to corral and subdue the population. This will require crafty military machinery that is always able to keep the people pinned down and subdued. Jade Helm is the beginning of the honing of the new US Military warfare. 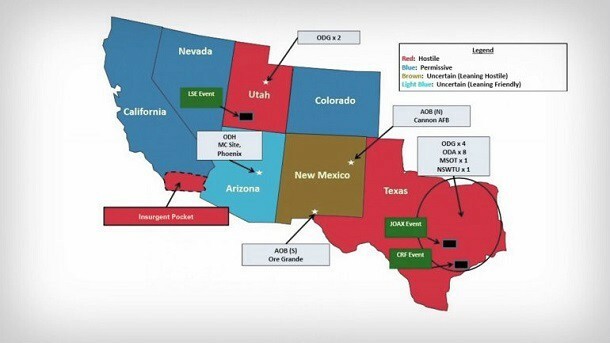 "Jade Helm is a "realistic" military training exercise involving elite branches of the U.S. military and will be conducted throughout seven states in the southwest. The drill is scheduled to begin July of 2015 and last 8 weeks. The troops are to "operate undetected" among the American civilian population." "Martial Law training exercises across the country this past week as the REAL ID will become mandatory next year the big event prophecy has now begun." Who knows the exact time table? How far-fetched is it to think that the military will use this event to prepare for the real event in the future? Special forces always goes into the attack zone first. They blend in with the population while gathering intel for the approaching attack. Every area has it's own quirky terrain. Every area has it's own unique obstacles to overcome. Every area has it's own Achilles heel that will be found now and attacked when it goes live. The police and the military train at shooting ranges in preparation for future events. Training is training and even the govt is calling this training. How many Olympic athletes wait until the day of the Olympics before they start to hone their skills?" 2015 New AARP Commercial Announces Martial Law Declared! Big Springs, Texas, is the site for residents who work for the federal prisons or private prison facilities—one of the largest areas in the world. US Federal Prisons and U.S. Marshalls have Con Air. Con Air aircraft fly from Arizona with transfer prisoners in handcuffs from Oklahoma bound for Big Spring, Texas. It’s facilitated by large fleets of transports. In the video at the link above, Thomas Meade, retired U.S. military now contractor and designer for the Jade Helm 15 exercise is speaking to the Big Spring City Council. Units from every military service, including FBI, DEA are also involved. Why Texas? Texans are major supporter of the military. They want the public’s help, a little nugget of information—(the Human Intelligence) to snitch. They want land owners and business owners to conduct (interrogations, water boarding) meetings. Increased aircraft at night, paratroopers, it won’t happen within city limits (too many power lines—it’s dangerous). Work primarily at night. JADE (Joint Assistant for Deployment and Execution) is a knowledge-based mixed-initiative system that supports force deployment planning and management. JADE uses case-based and generative planning methods to support the development of large-scale, complex deployment plans in minimal time. JADE incorporates the technology of three tools: Prodigy-Analogy (a combined case-based and generative planner developed by Carnegie Mellon University); ForMAT (Force Management and Analysis Tool) that supports case-based force deployment planning developed by BBN Technologies); and PARKA (a highly-indexed knowledge based management system developed by the University of Maryland). In addition, JADE employs an easy to use map-oriented drag and drop interface where force modules (FMs) from previous plans (cases) whose force capabilities and composition match the requirements of the current situation can be dragged from the case library and dropped onto a geographic destination. Plan modification and/or adaption is supported through remindings, e.g., each time that a force module is created or is copied into a plan (TPFDD) the user is automatically reminded of the need for geographical changes. Below are documents in pdf or html format. Field manual (FM) 3-39.40 is aligned with FM 3-39, the military police keystone FM. FM 3-39.40 provides guidance for commanders and staffs on internment and resettlement (I/R) operations. This manual addresses I/R operations across the spectrum of conflict, specifically the doctrinal paradigm shift from traditional enemy prisoner of war (EPW) operations to the broader and more inclusive requirements of detainee operations. ABSTRACT (MaxiJade Joint Assistant for Development and Execution Air Force Research Laboratorymum 200 words} JADE (Joint Assistant for Deployment and Execution) is a knowledge-based mixed-initiative system that supports force deployment planning and management. JADE uses case-based and generative planning methods to support the development of large-scale, complex deployment plans in minimal time. JADE incorporates the technology of three tools: Prodigy-Analogy (a combined case-based and generative planner developed by Carnegie Mellon University); ForMAT (Force Management and Analysis Tool) that supports case-based force deployment planning developed by BBN Technologies); and PARKA (a highly-indexed knowledge based management system developed by the University of Maryland). With JADE, a military planner can build a preliminary force deployment plan, including the Time Phased Force Deployment Data (TPFDD) in less than one hour. This speed in plan construction is possible because JADE supports the rapid retrieval and reuse of previous plan elements for use in the development of new plans. In addition, JADE employs an easy to use map-oriented drag and drop interface where force modules (FMs) from previous plans (cases) whose force capabilities and composition match the requirements of the current situation can be dragged from the case library and dropped onto a geographic destination. Plan modification and/or adaption is supported through remindings, e.g., each time that a force module is created or is copied into a plan (TPFDD) the user is automatically reminded of the need for geographical changes. "The 248-page manual presents updated policy and doctrine governing unconventional warfare, and examines its “three main component disciplines”: special forces operations, psychological operations, and civil affairs operations. Appendices include an historical survey of unconventional warfare as well as an extensive bibliography." Is Walmart a Trojan horse, loaded with a belly full of enemies about to deploy their evil upon this nation? Here are 23 startling facts about Walmart you REALLY should know...ESPECIALLY the last 7!! It will take time to process all the information presented. This information provides a mere snapshot, a glimpse, a beginning explanation of the concern over JADE HELM 15, the realities of what is happening, the long-term history, its implications, and its future in the New World Order government overtaking of America that is unfolding right in front of our eyes. The New World Order is preparing for the arrival of the Antichrist, dead Pope John Paul ll. The military has its boots on the ground and we are still trying to grasp the reality that is upon us. Luke 22:35-38: And he said unto them, When I sent you without purse, and scrip, and shoes, lacked ye any thing? And they said, Nothing. Jesus Christ knew we would need to be armed with weapons: not only with the Word (Jesus Christ), but in this passage, Jesus: says "he that hath no sword, let him sell his garment and buy one." Everyone should choose Life in Christ, pray, study the King James Bible, trust God, own at least one firearm, and choose to live in the peace that surpasses understanding. This list is some of the sins that bind and shackle mankind in the time of the end. These things sound familiar. These spiritual ailments are a part of today's culture. The wise see these things, and spiritually discern what time it is. Some of you have loved ones, spouses, family members, etc., who are not on the same spiritual level as you. Some have not received Jesus Christ as their Lord and Saviour. It spiritually grieves you, and breaks your heart. Don't give up! Through prayer, keep standing in the gap for your loved ones. There is a gap where you can position yourself between the judgment to your loved one and the mercy and protection of God. Moses stood in the gap for the children of Israel. Through prayer, I encourage you to stand in the gap for your loved ones. Standing in the gap is accomplished by going into your prayer closet, and lifting your loved ones up to God. God is watching and is in control as America and the world teeters on the edge of destruction. God is watching those who will depend on Him. He is watching to see which of those amongst the Body of Christ are going to make a wall of protection that can only come from Him.